We can’t control the weather. We don’t determine where trees grow, mountains form, or rivers flow. 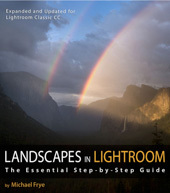 In landscape photography we have almost no control over our subjects, so we have to adjust to the conditions at hand. Craft & Vision just released Issue 15 of Photograph magazine, which includes my piece called “The Art of Being Flexible.” I think flexibility is an essential skill for landscape photographers. Since we have so little control over our subjects, we have to be willing and able to react to changing weather and conditions, and try to take advantage of whatever opportunities present themselves, even if those opportunities weren’t what we expected. 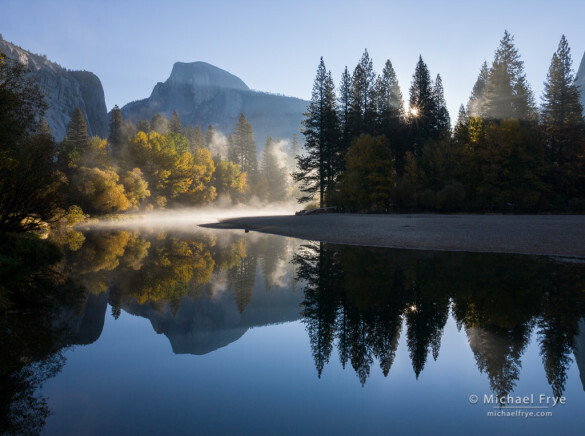 The article discusses this subject in depth, and includes several examples showing how to anticipate the weather and light, recognize possibilities, and take advantage of the opportunities you’re given. I’ve become increasingly aware of the power of visualization over the years. Looking back through my own work, it’s clear that my best photographs were created when I had a strong response to a subject or scene, knew the feeling I wanted to convey, and was able to visualize in advance how I wanted the finished image to look. This photograph of tundra swans seemed appropriate today. Swans mate for life, so you always see them in pairs, or in a small group when parents are joined by their young cygnets. The two subjects of this photograph were undoubtedly a mated pair. One of the challenges of photographing these swans was that they kept their heads underwater for long periods of time while they were feeding. Periodically one of their heads would pop up briefly, but then plunge underwater again, and it was rare for both swans to have their necks raised at the same time. I expended many pixels trying to capture moments when both swans had their heads up. Even when I managed to catch both of them with their heads visible, often one of the swans would have its back to me, or be in some other awkward position. But I stayed alert and patient, and eventually things came together. Both swans lifted their heads for maybe ten seconds – an eternity, it seemed – while I held down the shutter button. At one point the swan on the left even turned its head and looked back at the swan on the right. Perfect. 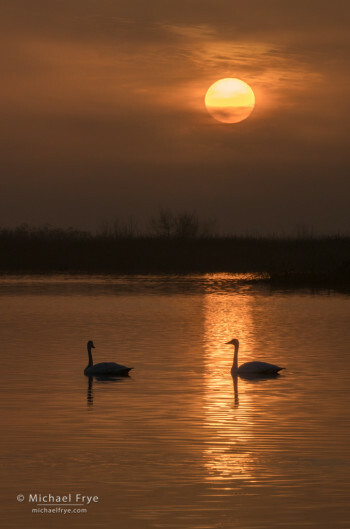 That little gesture made a big difference in the photograph by creating a visual connection between the two swans. Claudia and I have made several trips to California’s Central Valley this winter to photograph birds. 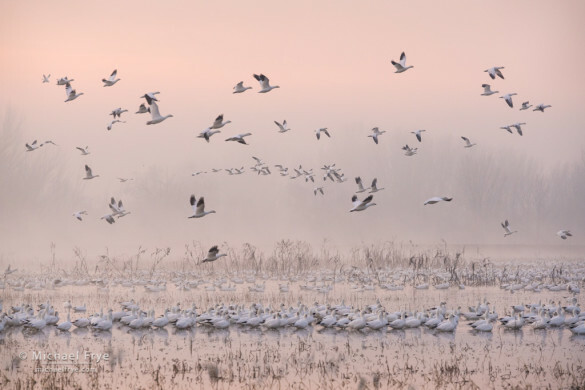 It’s one of our favorite things to do this time of year, when large flocks of waterfowl take up residence in the valley’s marshes for a few months before migrating northward in the spring. I love watching and photographing the movements of these flocks, especially the white geese – the snow geese and Ross’s geese. Seeing 10,000 geese take off in a single, noisy, coordinated wave is simply awe-inspiring, but there’s magic and beauty in their smaller comings and goings as well. 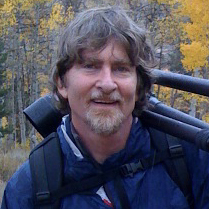 My approach to photographing wildlife is similar to my approach to photographing landscapes. Rather than making closeup photographs of individual animals, I’m trying to incorporate the animals into the landscape, looking for ways to capture a mood and convey what it felt like to be in a particular place at a particular time, watching a unique and beautiful moment. 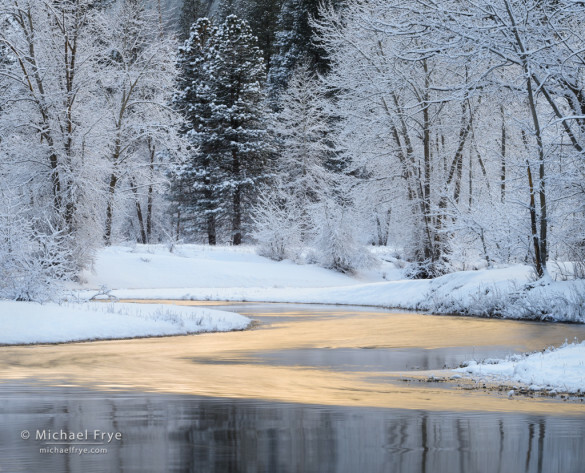 Reflections along the Merced River, winter, Yosemite. I tried several different versions of this photograph. I initially wanted to include a wider view, with more trees on the sides, but a distracting log just out of the frame on the right bothered me. In the end I liked this tighter, simpler, distraction-free version better. 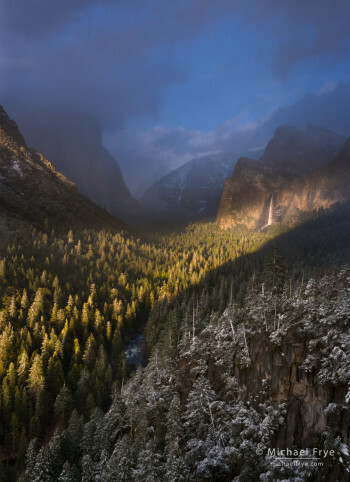 Yosemite Valley received two doses of snow this past weekend, first on Friday night, and then again on Sunday night. I wasn’t able to make it up there on Saturday, but Claudia and I drove up early Monday morning after the second snowfall. The storm had cleared around midnight, and temperatures then dropped down to 25 degrees. Below-freezing temperatures inhibit the development of fog and mist, so the skies were clear when we arrived in the valley. But we found three to four inches of fresh, fluffy snow coating all the trees. As I mentioned in my last post, the fog display on Thursday morning might have been even better than Wednesday morning. It didn’t look very promising at first. There was no fog at our house, and none in Mariposa either, so I knew I had to go lower. Claudia was with me this time, and we decided to take a back road that headed west into the lower foothills. At one point we crested a ridge, and there, below us, was the sea of fog. Again I was fortunate to find a good viewpoint looking toward the southeast. This time there was a layer of high clouds above the fog, already starting to turn color with the sunrise. Best of all, a double-peaked hill was poking up out of the fog in that direction. 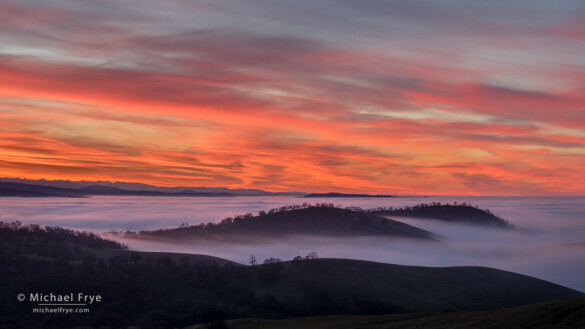 The image at the top of this post is an early one from that morning, with a brilliant sunrise above the fog and hills. After the sun rose, the fog lifted into some nearby ridges, getting high enough to almost – but not quite – obscure that double-peaked hill. Soft backlight filtered through the high clouds, bringing out beautiful textures in the fog (see the two images below).